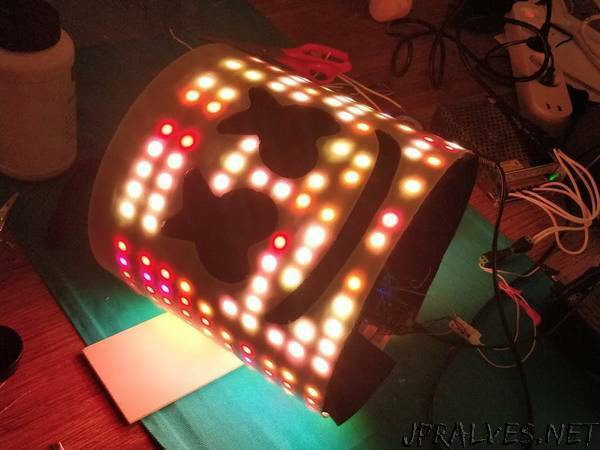 “Marshmello Hat with LEDs and ESP8266 web server control for effects. This time I wanted to create a fancy blinking hat for parties (and room accessory). You can use an Arduino to loop through the effects, or an ESP like in this example to make it controlable over WiFi. Unfortunately, my DIY market was offering 15L white buckets only. If you plan your own hat, I suggest you at least 29cm in diameter and 35cm in height (20-25L). I bought a helmet and extracted the inlay. The meme was printed on a sheet of paper and cut out. I removed the holder and the meme from the bucket. I started with a boxcutter, but it got difficult on the eyes. Later I switched to a soldering iron, which was way easier! I glued the black grid into the eyes and mouth, to make them look black (and hide my face).